At 3:35 p.m. 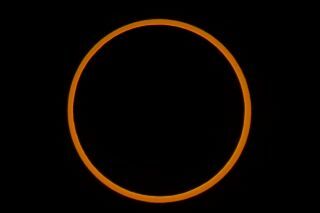 ET today, people living in the northern edges of Australia should be able to view a total solar eclipse, the last one until 2015. Here are some of the most famous eclipses in history. One of the earliest solar eclipses recorded, the Ugarit eclipse darkened the sky for two minutes and seven seconds in 1374 B.C. Mesopotamian historians in Ugarit, a port city in Northern Syrian, recount that the sun was "put to shame" during this total eclipse. In 763 B.C., the Assyrian empire, which occupied what is now Iraq, the sun was completely eclipsed for five minutes. Early records from the period mention the eclipse in the same passage as an insurrection in the city of Ashur, suggesting that the ancient people linked the two in their minds. The Christian gospels say that the sky was darkened for hours after the crucifixion of Jesus, which historians viewed either as a miracle or a portent of dark times to come. Using astronomy, later historians have used this mention to pinpoint the death of Christ. Some historians tie the crucifixion to a one minute 59 second total solar eclipse that occurred in the year 29 C.E., while others say a second total eclipse, blocking the sun for four minutes and six second, in 33 C.E. marked Jesus' death. The Koran mentions an eclipse that preceded the birth of Mohammed. Historians later tied this to a total eclipse that lasted three minutes and 17 seconds in 569 C.E. The sun also disappeared for one minute and 40 seconds after the death of Mohammed's son Ibrahim. But the world's first Muslim didn't believe that eclipse was a sign from God. Instead, according to Islamic texts called the Hadiths, Mohammed proclaimed "the sun and the moon do not suffer eclipse for any one's death or life." While the ancients viewed eclipses as signs of great acts of God, physicists viewed the 1919 solar eclipse as a triumph of science. During 1919's epic eclipse, in which the sun vanished for six minutes and 51 seconds, scientists measured the bending of light from the stars as they passed near the sun. The findings confirmed Einstein's theory of general relativity, which describes gravity as a warping of space-time.